“Now might be a good time to change the oil if you want,” Larry said, as we looked at Mark’s 750 cc Suzuki ATV high centered on a stump. 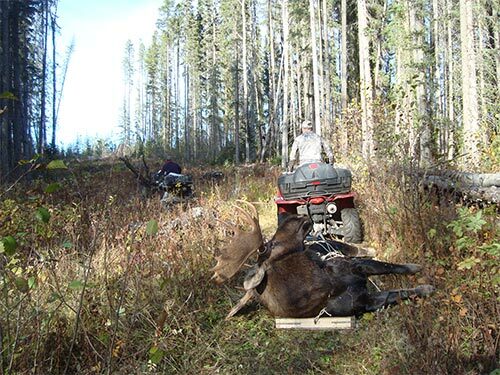 Mark had been pulling Fred’s 1100 pound moose on his brand new moose toboggan up the old skid trail while being pulled himself by Fred on his ATV. “I guess I didn’t see that,” Mark said as we rocked it back and forth to get it off. It was October 4. After some luck with the LEH gods we were up in one of our favourite areas in north-central B.C. 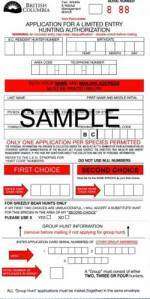 seeking a moose or two. Our third partner Larry had come up from the Lower Mainland several days earlier than us and had set up in an excellent camp near a lake. That's Fred on the left, then Larry and then me. At the widest point the big moose measured 50 inches across! 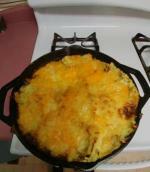 Fred and I had left Vancouver on September 25 and arrived up at the lake on the 27th. Larry filled us in on what he had found scouting around and told us about the neighbours. Larry said that over at the next campsite an archery hunter, Mark was there with his 87-year-old father and that he was very helpful and open with information about the area. The next day Fred took off on his new 400 cc Suzuki ATV to try it out as he had never really driven it anywhere, and Larry took me around to several nearby spots, a long narrow dry marsh only two kilometres from camp, and a little lake surrounded by marsh as well. 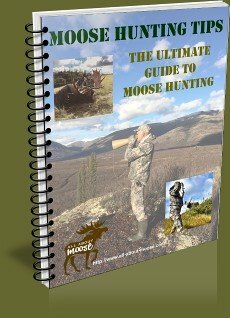 I had pre-scouted the same lake with Google earth and I thought as well that it was a likely spot to eventually see a big moose though once we walked down to the lake’s edge I wondered how the heck we would ever recover a moose if we shot one the 300 to 400 yard distance across the lake. I’d find out some valuable information a little later in the week. Fred and I went over to Mark and his father Bud’s well – organized camp and we met and chatted. Mark said he’d been calling and seeing bulls already, but nothing was coming close enough for an archery shot. He said as well that places with lakes were the place to look. 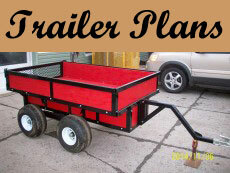 The following days we were busy learning what we could on our own about the area. Larry had brought topographical maps of the area and there was one lake we were trying desperately to locate and it seemed to be surrounded by marsh too. We went up a nearby logging road and I sat very still at the edge of a small cut for a while, calling occasionally with my old tomato juice can and then started off downhill for the lake hopefully. I was in touch with Larry on the radio and after checking out a small marsh on his own he joined up with me and we continued down through the trees and a bit of a tangle until sure enough, we came to the lake. It was a beauty, calm and blue and surrounded by golden marsh grass, but no moose. I looked across at what could possible be a clearing and sure enough we found out later that there was a logging road that came very close to it on the other side. Mark told us it took him four years of hunting the area before he found that lake. Even though we hadn’t seen a moose yet, Mark was coming over every evening and showing us the video of the day, another big moose he had called in. He helped us with our moose calling techniques though, and Fred caught on very quickly and pretty soon Fred and I abandoned the juice cans we’d been using though Larry continued to use his old Pringles potato chip cardboard can with the string. Larry and Fred had bagged quite a few grouse, so we enjoyed a grouse stir fry and I even saved three for roasting in the fire. Seeing as we were camped by a beautiful long lake, I decided to take advantage of Fred’s canoe with oars and went fishing and hunting over the next few days, catching a five pound bull trout and finding a nice little pocket marsh on the other side of the lake full of big moose tracks. I liked it so much I went a day later too, enjoying the views of the mountains in the distance. My wrist started to hurt though and by the next day I could barely do anything with my right hand. Found out later I’d given myself tendonitis. On October 4 Larry decided he was going down to the lake approachable from the other, higher road and Fred and I each picked sections of the clear cuts and adjoining timber stands to hunt in until about 10:30 when we met up and decided to go back to camp for breakfast. Just as we were passing the 2 km marker on the road out, Fred said “Stop here,” and I did and he got out saying. “I can't see over this berm here, but it looks very interesting down there”, and he took off with just his rifle. He hardly ever does that as he is diabetic and keeps his medication and chocolate bars close at hand. I didn’t expect him to be long so I stayed in the truck and turned on the radio. I hadn’t been able to get any reception in camp down by the lake and was surprised to get something. It was just 11:00 o’clock and I picked up the CBC news. I had just listened to a couple of items when “Bang!” I heard a shot from down where Fred had gone. I sat for a moment, then shut the radio and got out the truck. I heard Fred cow calling down the skidder road and thought why is he calling still? 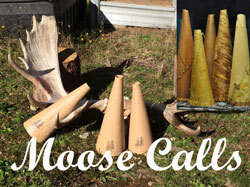 Did he wound a big moose and is trying to call it back? That would unlikely. Then from about 300 0r 400 yards up the logging road I heard another cow call. For real this time. I grabbed my rifle from behind the seat and started down the skid trail, it was really easy walking except for a few windfall trees. I walked down about 100 yards and turned a corner and saw Fred about another hundred yards down the trail. He was pointing his rifle down hill, moving from the trees to into the trail and back and looking downhill. He looked up and waved me down. When I got to him he told me that he had noticed fresh droppings and beds so let out a cow call and had a bull respond right away and come to the edge of the trees. He tried to shoot but had forgotten the safety on, took it off and just saw enough antler at the edge of the trees to know it was a bull and enough brown hair through the trees to shoot at and pulled the trigger. Right at the shot a moose burst right across the trail and disappeared into the trees on the right but he couldn’t find the path, no flattened grass, no blood, no skid marks, nothing. So we started slowly down the trail looking for any sign at all in the grass, on the ground and in the bush at the edge of the trees to the right. We couldn’t find any sign where any big moose had crossed the skid trail, nor a drop of blood. “Me too,” I said, and we both looked around. We were both still thinking the moose must be to our right, but I noticed that the breeze such as it was, was coming from our left. I looked to the left and immediately saw a big dark shape at the base of the trees at the edge of the skid trail, dark reddish brown antler points almost glowing in the mid day light. Fred... checking the bullet entry spot on his big moose. In this case the shot placement was perfect! We walked over and sure enough, Fred had knocked down a big bull. It must have 1000 pounds on the hoof, with wide antlers that we later measured to be 50 inches across. There was going to be some good eating this winter! I thought about gutting it right away, but first we had to take a bunch of pictures of Fred with his bull, and I got in a few too. Then we decided to head back to camp and get Fred’s quad and ropes and things and see if Mark was free. We’d need his help too. Sure enough, Mark showed up at camp shortly after us and Larry had joined us by then, so I rode up back to the site with Bud and Mark followed us on his quad with Fred on his machine too. Back at km 2 on the road, Larry started cutting a trail with his chain saw and Mark came along with his Poulan on his quad and together they cut windfalls and stumps up and we all collectively pulled them out of the way so that the quads could make it down to the moose, 400 yards from the logging road. Mark pulled his new moose sled down as he went. Down at the moose after some consultation, we decided to leave the moose intact and pull it out in one piece and gut him up at the road. 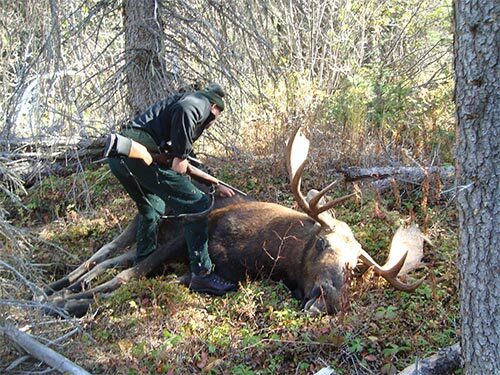 We had to cut more fallen down trees out of the way and pulled the moose out by his hind legs as the head would of course had hung up if we pulled him out head first. We almost had to flop him right over to get him out through a slot in the trees, with the use of a pulley and some planning, managed to get him out to where we could roll him onto the sled. It wasn’t easy, but we finally managed to get him onto Mark’s sled and tie him down. After a few pulls with Marks quad though, one of the eye bolts on the two-by-four frame pulled and we had to re-lash the moose into the sled with just about all the rope I had brought. We had him in there rear end first, and then cinched up the ropes so the head with the big rack wouldn't hang up. Mark got the big moose almost a quarter of the way up the trail but then started spinning out. Fred ran in front with his quad and we hooked the quads together with a kind of bungee cord/tow line Mark had and with the two quads in tandem and minor hang up mentioned at the start, managed to skid the moose up towards the road. Up at the road we dumped the moose out of the toboggan and Fred held the legs while I gutted it, then Fred jackknifed his quad trailer into the ditch and hooking a pulley up on the other side of the road, and a lot of rope, hooked the moose up to Larry’s Toyota land Cruiser and pulled into onto the trailer. 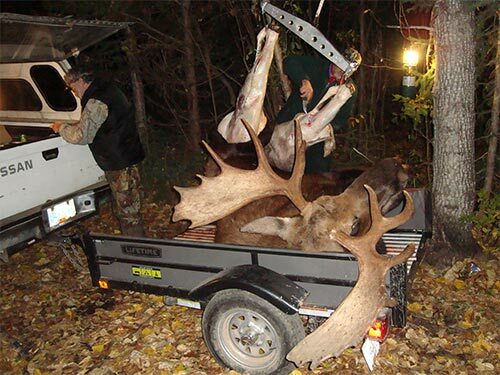 We lashed it onto the trailer and drove back to camp and started the whole process of hanging the moose up at the stout hanging pole at Mark’s camp. Fred's Big Moose already hanging from the gambrel while he skins it. 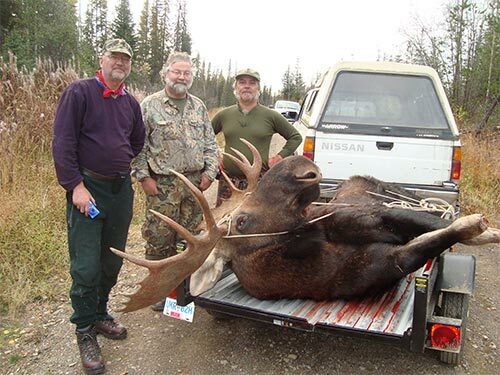 Fortunately, Mark is a machinist and he had a solid aluminum All-About- Moose brand gambrel on hand and using a vehicle we ere able to hoist the back end of the moose up bit by bit while Larry and Fred skinned. By then my wrist hurt so much all I could so was watch. It was midnight by the time we got the moose skinned, cut in half and hung up on the pole. I wrapped it up in sheets, put a tarp around it and we were done for the day after 13 hours of dealing with the big moose. We were sure grateful for Mark and Bud being there. You need a lot of hands to take care of a big moose and lots of machines help too. The weather was so nice that after three days we had to take it in to a butcher for processing before it went bad. On our last trip we’d hung two moose and two deer in camp, the longest for 10 days before bringing it all to town for processing. In this case we go to meet a very nice butcher in Smithers who offered to cut for us at 45 cents a pound if we helped wrap. What a deal, so that’s what we did. All in all it was a good trip. We went to a new part of the world, made some new friends in Mark and Bud, and are already thinking all about big moose for next year.